My mind is a mystery to me. In it is stored a library of miscellaneous facts, stories, ideas, and emotions. Anything which flows past its grasping reach is gathered in, filed, and kept for use as required! Walking across the front lobby, I glance out the front door and windows and stop and gasp. There, spread before me, is a scene beautiful beyond description. Framing the far side of our covered drive-in entrance, there is a flower bed. 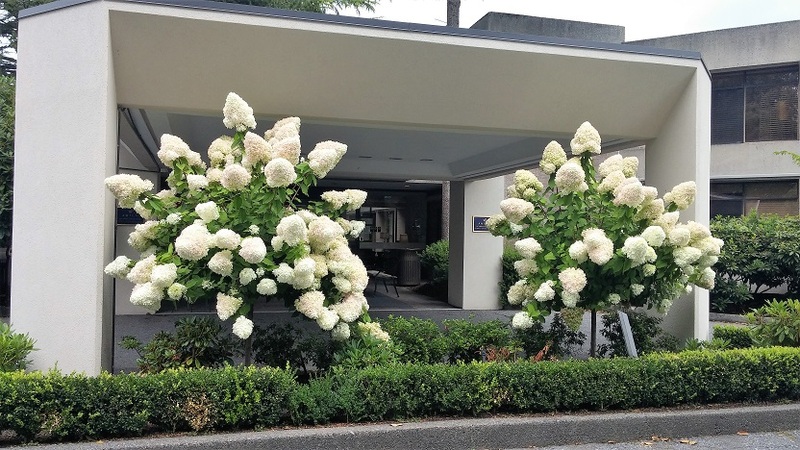 It features a pair of unusual hydrangea bushes, with huge white blossoms. I know they are there. I know they are beautiful, but they hardly register anymore. My glance is usually focused on which taxi is waiting to discharge its customer, or the mailman with the day’s mail. What jarred me awake today? What caused my mind to dig in its files, and come up with the first line of a hymn I sang eighty-four years ago – “Open My Eyes That I May See”? 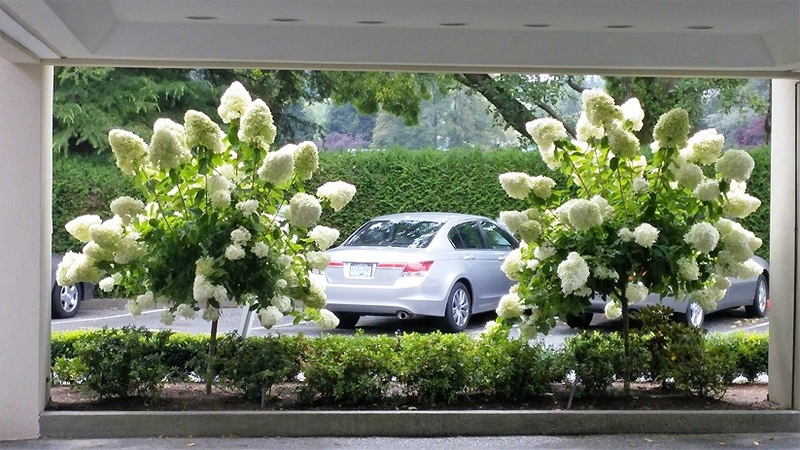 I think to myself that there is no denying that I have been looking at those hydrangeas without really seeing them. How much pleasure and appreciation I missed with this lack of awareness. My thanks to Liz Koerner, Vancouver artist, for these photos. His voice rings out, jarring me out of my concentration. The path is steep, and my walker’s basket loaded. I cling to the railing with one hand and my walker with the other, picking my way toward the pathway below. I shift my weight again, trying to find a comfortable spot on the oak bench. Then the judge enters and the ceremony begins: the one in which a young man in my family will become a citizen of Canada. A few days ago I knew very little about the Philippines. If asked, I would have said it was a group of islands in the South Asian seas, and the home of very nice people, if the staff in my seniors’ residence are anything to go by! But that was a few days ago . . .
Marnelli is serving our table. She is a small, cheerful, friendly individual who moves quickly. I make a casual query about the Philippines. Despite the excited punctuation, this is not news: Change is the one constant mankind knows. Countless millennia ago some venturesome animal stood up on its back legs and stepped out into a new life, never to be the same again. The sixth presentation in this series. In the summer of 1937 the Thompson family is still on the farm, but they are busily packing up for a big move to temporary rental accommodation in Calgary. Belle and Will are both determined that their two daughters, Doris and Marjorie, get good educations. While Marjorie finishes her Grade 8 at the one-room country school, Doris takes as much of Grade 9 as is available by correspondence. The Thompsons enjoy their hiatus in California, but in the early fall of 1924 they pack up and head back north to Canada. When they arrive in Standard on the train, they walk from the station on a boardwalk. Just two years old, Marjie has never seen one and is afraid to step on it, so Will carries her. An old friend who was alerted to their arrival meets them. He loads them in his car, and drives the seven miles to their farm. It’s a wonderful feeling to be back in Alberta. The fourth presentation in this series. January 2nd, 1918. Belle and Will are man and wife, and on the train heading for a honeymoon trip in California. The groom is of Danish descent, a farmer in Canada, and the bride a teacher whose home is a manse, wherever her Dad is preaching. It is their first trip together. Will has offered Belle a choice. His car in Canada is old, and needs replacing. The price of this will be about the same as the cost of a honeymoon in California. Which does she prefer? Belle does not hesitate. “California! You can drive an old car a long time, but this is a chance to see a wonderful place. It may be a long time before we can again afford to go.” Will is delighted. Marriage means the possibility of children. It also means the expense of building a home on the farm. After a honeymoon in California, the newlyweds travel to Calgary, Alberta, Canada. For the first time Belle sets foot in the country which will be her home for the rest of her life. Will settles her in a lovely hotel, the Palliser, and returns to his farm. His abode there is a small two-room shack. By March, when the temperature has moderated, Belle insists on joining him. I turn from my computer, and look at a framed 98-year-old bill from J. H. Ashdown Hardware for cooking and housekeeping needs. The list has been scrutinized carefully. A couple of items scratched out brings the total down from $110 to $106. Belle and Will, you would be surprised! After almost 100 years that Ashdown Hardware bill tells me many things. Your shopping trip was on March 8th, 1918. It seems Belle was shopping not just for the bunk house, but for the permanent home which was underway. The list included a special stove, a stove brush, a six-gallon power churn, a kneading pad, and a chamber pail! The summer of 1918 is more than busy, it is hectic. Belle is learning to carry her water from a pump, how to light an oil lamp, which vegetables to plant in the garden: a never-ending list of “firsts.” She is alternately amazed, amused, and excited. Her days are full and happy. Fortunately, she does not need much guidance. Will is over his head with urgent tasks – from planting a crop to supervising the building of their new home. This is a summer neither will forget. The next four years produce one crisis after another. Will develops a stomach/digestive problem so serious he finally travels to the Mayo Clinic in Rochester, Minnesota. The disorder is diagnosed as stomach ulcers; the cure is doubtful. The doctors at Mayo prescribe a diet which has been found to help. He returns home and carries on, with better health. In 1920 their hopes are realized when Belle becomes pregnant. Their first baby arrives on March 28th, 1921. Doris, a wee five-pound baby, is fine, but Belle almost dies. Will contacts her family in Iowa and tells them that the doctors think she will not survive. Predictions! Never depend on them. Belle does survive, and is thrilled with their dear little daughter. She is distressed when she remembers the doctors’ advice not to have any more children. Will hires extra household help. They both delight in watching their little girl learn to walk. 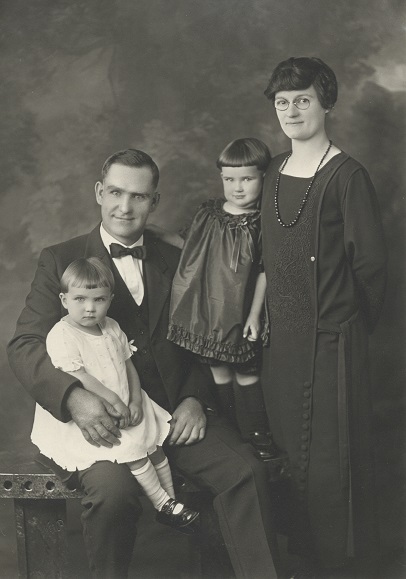 Then, to the surprise of (almost) all, 14 months after Doris was born, another baby girl, 7 pounds this time, arrives to complete the family on May 29th, 1922. This time Belle chooses not to go to the hospital. A home delivery with local help issues the new member into the fold. They are now a family of four. 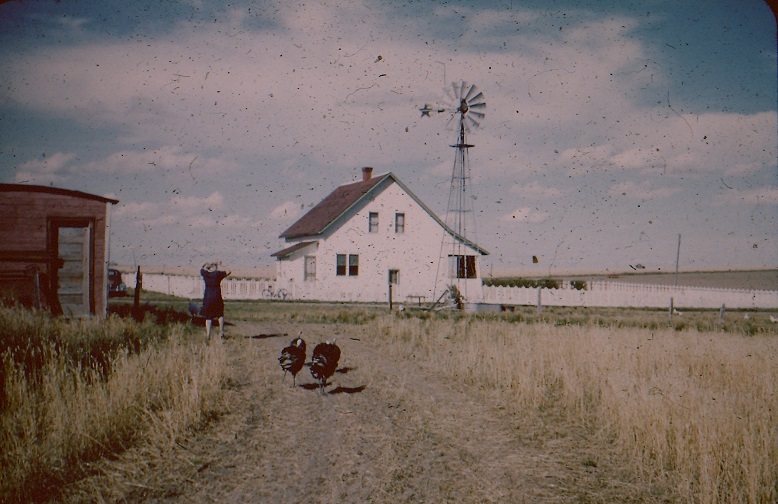 The home is a nice farm house (which 96 years later still stands). Their love and enjoyment of each other never waver. Life often deals out unexpected challenges, but they are confident that together they will handle whatever comes. And so their family becomes temporary residents of Long Beach, California: a beneficial move for all. The interesting surroundings, warm climate, available household help, reduced tension, and increased leisure time are the right medicine at the right time. It does not take the Thompson family long to settle into their new home. Through an agency Belle hires Alma, a nanny. She will work five days a week, providing her little child can come with her. Sunny is about the same age as Doris. A week’s trial proves satisfactory, so that is settled. Belle can now get extra rest. Alma manages the three wee girls with ease, and Doris loves having a playmate. At first the fact that Alma and Sunny are black feels strange to Belle. She has never had a personal relationship with anyone of another colour. It is a learning experience for Belle and, fortunately, a good one. Meanwhile, Will scouts the neighborhood to see what it offers, locates the best sandy beach on the ocean front, and buys a second-hand car. As his health improves and his vigour begins to return, he takes a job as a carpenter. It fills some of the days, and brings in extra income. The novelty of living such a different life in such unfamiliar surroundings is challenging, interesting, and good for their health. Lonely they are not. They contact Belle’s aunt and uncle, who are very elderly and delighted to have young relatives close by. It is fortunate that they are able financially to have this hiatus and to be wise enough to recognize their need to take it. This story continues and is picked up again several decades down the road. Check in and see where Belle and her husband and children are living, and how, in general, Belle views life then. The third presentation in this series. I pick up Belle’s story as she charges on through the early years of her adulthood: teaching during the school year, looking for work in the summer, living in her family home when work permitted.